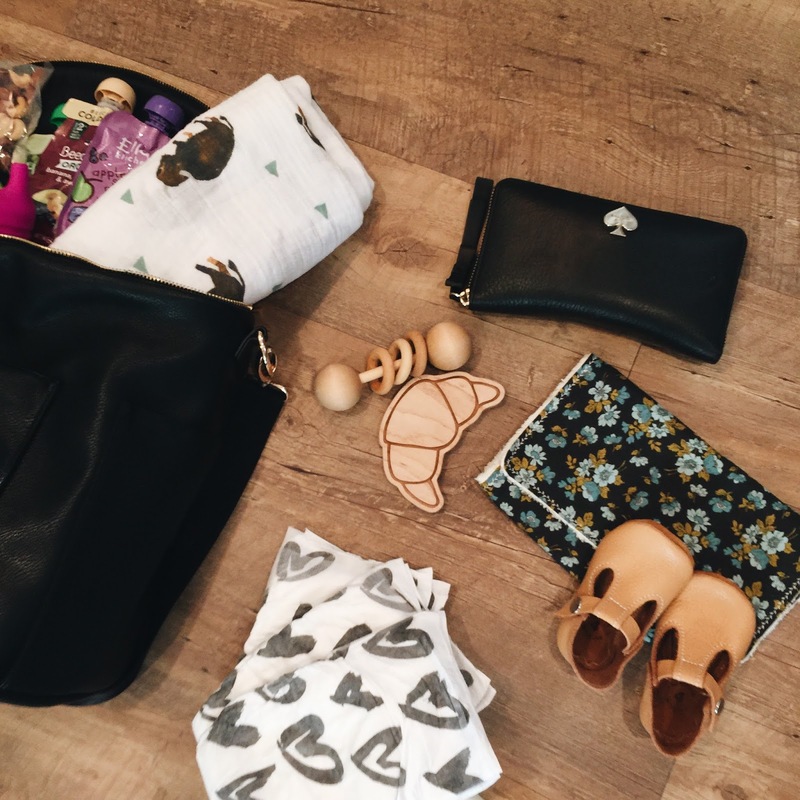 I have been using my black Fawn Design diaper bag since Penelope was born; it was the bag I packed and brought to the hospital. I love how much space I have and that it doesn't look like a traditional diaper bag. I even use it when the girls aren't with me. The feature I've been loving the most lately is that I can wear it as a backpack, which I seem to do more often than I ever have before because my hands are usually full and wearing it that way frees them up and keeps the strain off my shoulders and back. 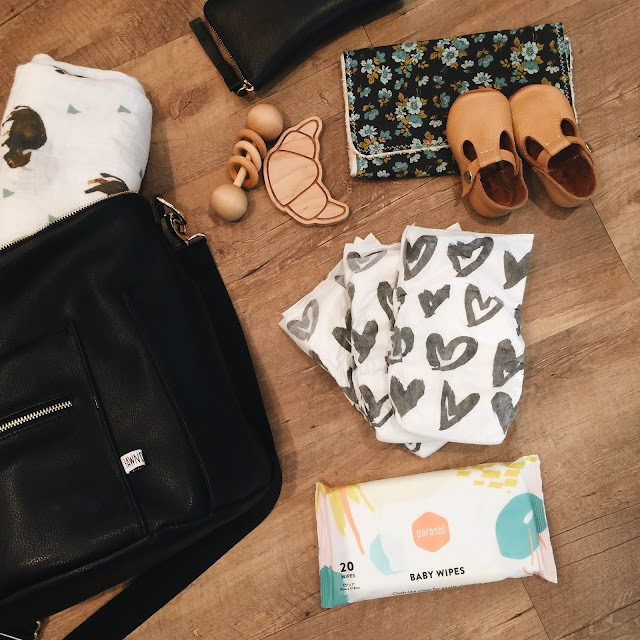 Olivia is potty trained so that eliminates the need to pack much for her, but I always keep Parasol diapers for Poppy and a travel pack of our favorite Parasol wipes in my bag. I use the wipes for everything -- both girls, myself, our hands, faces, wiping down carts, surfaces of every sort and more (plus they smell ahhh-mazing!!) and now that we've been using Parasol diapers for the past few months I'll never buy another brand. You can read more about why we love our Parasol diapers and wipes so much in a recent post here. And to receive 20% off your first subscription from Parasol, simply enter BLESSEDNEST at checkout here. I love these tweat snack cups for packing snacks for the girls because they can reach in to get the food but I can snap them shut to keep it fresh. I've used other snack containers in the past they can reach into but that don't have a closing lid and after a few days the food always went stale. Olivia's snack of choice for errands is animal crackers or Annies fruit snacks and Poppy always loves puffs or baby goldfish. 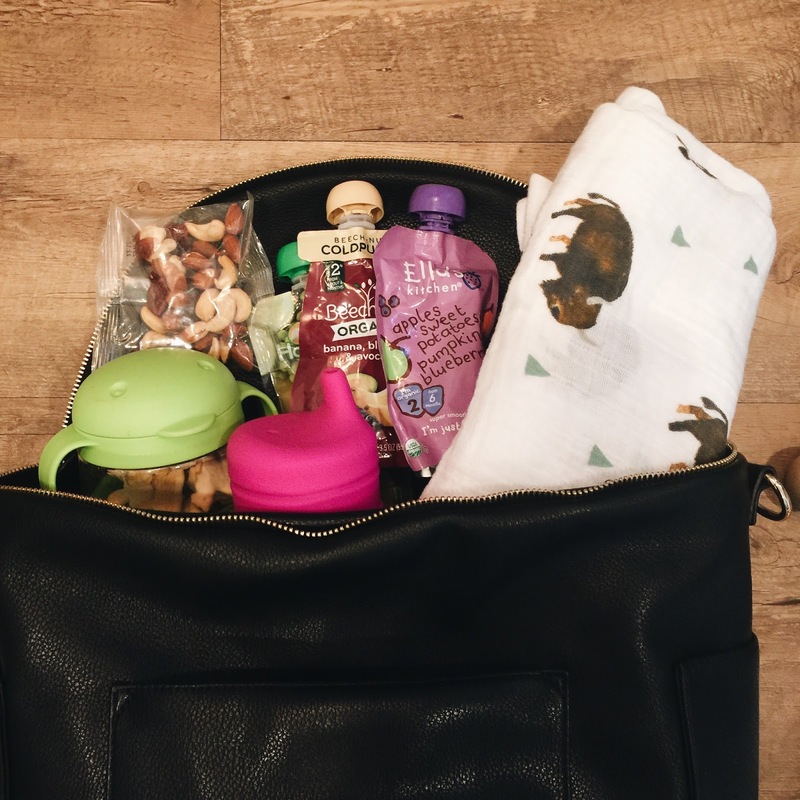 I also pack some organic pouches and depending on where we're going, usually have a sippy cup of almond milk for Penelope and a water bottle for Olivia. I love these Boon silicone sippy cup lids (perfect for throwing in your bag to be put on any cup to turn it into a sippy cup) and these Skip Hop straw water bottles, which both girls love and for us have been completely spill proof. Even after I've packed all that, I've still got room for my essentials: wallet, keys, phone and a granola bar, trail mix or bottle of water. I also keep a lightweight muslin swaddle blanket in there (another item I use in 100 different ways) and a burp cloth as well as a pair of shoes for Poppy (because I rarely put them on her before we leave the house) and a teether or small toy. In our SUV I have a large center console bin (we have this black one but I also like this one) that holds lots of other items I like to keep handy but don't want to pack in my bag on a daily basis and lug around. These include: change of clothes for both girls, sweatshirt/jackets for each of them, warm blankets, full pack of wipes, extra diapers, empty sippy cups, water bottles, extra snacks, a few board books, a carseat cover, first-aid kit and full box of kleenex. They're all within reach of the girls carseats' so Olivia can grab what she needs anytime and if I need to replenish my bag with an extra diaper or snack I have it handy when I'm out and about. 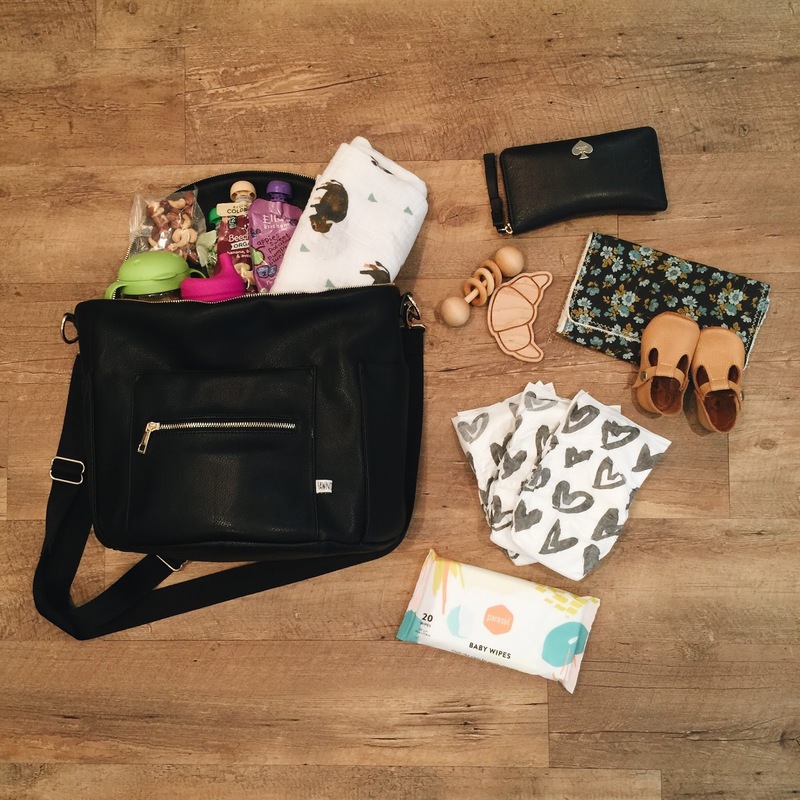 What do you pack in your diaper bag?! Is it pretty similar to mine? I'm so excited to pack my bag again in a few months for baby #3 with tiny newborn clothes and itty bitty diapers!! WHat skippy cups do you use?